Canberra: Australia’s foreign minister on Wednesday backed the formation of a security pact with India and the US, a tie-up that could fuel China’s worries of being fenced in by wary neighbours. It is the latest move by Australia to take a bigger role in the region’s security. Earlier this month, it agreed to host a de facto US base in the north of the country that would provide military reach into South-East Asia and the South China Sea, where China has disputes with several other states over sovereignty. 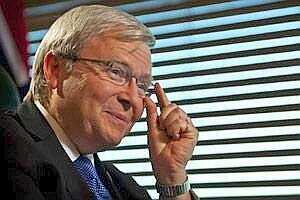 It was unclear why Rudd, a Mandarin-speaking Sinophile, would risk irritating Australia’s top trade partner China, which is already nervous that US President Barack Obama’s latest diplomatic push into the Asia-Pacific is part of broader US policy to encircle it. But Rudd earlier this month said Australia’s security arrangements with the US were not “snap-frozen in time", and while China wanted to see the elimination of US alliances in East Asia, Australia disagreed. “We are not going to have our national security policy dictated by any other external power. That’s a sovereign matter for Australia," he said. At a briefing in Beijing, Chinese foreign ministry spokesman Hong Lei did not comment directly on Rudd’s comments. Asked about the proposal, Hong said, “China hopes that countries in the region will do more to promote regional peace, stability and development." In a visit to staunch ally Australia this month, Obama also agreed with his host to explore the establishment of a joint naval base on Australia’s Cocos Islands in the Indian Ocean. He denied it was aimed at countering a more assertive China. But prominent Chinese military commentator, People’s Liberation Army major general Luo Yuan, this week said Washington was clearly trying to fence in Beijing. “The United States is making much of its ‘return to Asia’, has been positioning pieces and forces on China’s periphery, and the intent is very clear—this is aimed at China, to contain China," Luo wrote on the website of the People’s Daily newspaper. China says its defence spending has grown sharply to around $95 billion, with an aircraft carrier recently launched and a stealth fighter aircraft unveiled amid renewed Chinese claims to parts of the Pacific and contested areas of the South China Sea.